They've arrived! The Benedictine Sisters of Erie will host an exhibit of 25 prints from the Saint John's Bible, the first handwritten and illuminated bible in 500 years. The exhibit opens Sunday, October 25 and closes Wednesday, November 25. Groups are welcome and both a self-guided tour and a tour guide are available. 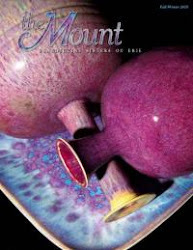 The monastery gift shop has a sampling of cards, posters and books from the Saint John's Bible project. The full site for this marvelous ten-year project is here. Warning: if you go to this site be sure you have time---you're going to want to browse for awhile. Mission Sunday, October 18 this year, is always a special liturgy at the Mount. Many of our sisters have visited or ministered in countries of Latin America or Africa and even in rural mission-like parts of the US. For this annual October event many of them get a chance to wear the native clothing they brought back and to bring out the art and other remembrances they have.